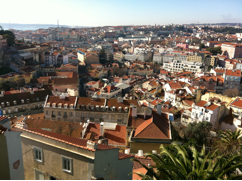 I spent last weekend in the wonderful city of Lisbon, under a blue sky, lots of sunshine and an pleasant spring-like 18°C! The atmosphere in the city is super-relaxed, the best description I heard was “like Barcelona on tranquilizers”. A couple of months ago, Venessa Miemis pointed me to the website of SandBox, a movement/network of young entrepreneurs < 30 years old. I am almost double that age, and was very pleased and humbled when the organizers accepted me as one of their elderly guest at their first Sandbox Global Summit. A few weeks ago, I had a Skype call with Laura Merling from Alcatel Lucent in San-Francisco in the context of our crazy Corporate Rebels United initiative, introduced her to the organizers, and she was accepted as well to attend. 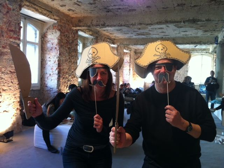 Here we were: two corporate rebels together enjoying the energy and enthusiasm of 200 highly energized young folks. Sandbox is all about incubating people versus incubating projects: I love the idea of building a strengths based society on the energy of this young generation. Sandbox is now a community of 700 young leaders. 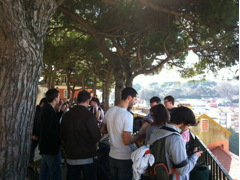 About 200 of them were present at Sandbox Lisbon (twitter hash tag #lisbox12). The event site suggested something that would be anything but a traditional “conference” and without any “keynotes” as most of the participants were each keynoters on their own right. I was indeed quite impressed with the quality of the audience. The event formula was in essence a un-conference format, but where the session owners were pre-listed with their subjects before the event. The event was really very well executed: personalized welcome for all participants at the airport, great catering, breakfast you don’t even see at sibos, excellent ice-brakers for speed-dating, many ways to mix up groups, well managed serendipity, trips in town, speed dating, collective raising hands to call for silence, and at the end a crowd-produced playbook: a post-event testimonial guidebook for change-makers, with Bloomberg Businessweek co-production. All this smells very Innotribe of course, and that’s great! We have a bit different emphasis on design, facilitation, immersive learning experiences and performance and it would be great exchange ideas and to explore with Sandbox some sort of co-production at one of their or our events. 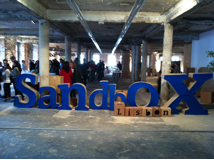 What was really very cool at Sandbox was the decoration by cardboard company Oupas! Design: its amazing to see how many shapes in cardboard one can built in no time. The whole event took place in the former HQ of a Portuguese bank, now Museum for Fashion and Design of Lisbon, close to the Plaza di Comercio. Sandbox had “occupied” the third floor, which was just an empty space 5 days before the event. During the opening session, the core group of Sandbox explained what they were all about: young do-ers with a passion for change, a passion for impact, and together on an “expedition” to become the leaders of our world in 20 years. What if they would meet and connect now when they are <30, and not when they are in leadership positions when 50+. and deep circles of trust ? They also had some big name sponsors: Bertelsmann, Siemens, and Bloomberg Business Week. It was a nice coincidence to see that the edition of Business Week where our Innotribe DAG incubation project was covered, was one of the giveaways at the event. I have rarely seen such a concentration of young brainpower, and any smart company interested in recruiting from this well should not hesitate in sponsoring this organization. Growing the community from 700 to 2-3000 members: in my opinion they will have to monitor very closely the quality of their members, if not the whole concept will dilute very quickly. I don’t know: it seems to me difficult to maintain the deep circle of trust concept when commercial and investment interests start to mingle. And I would like to see some of the “un-polished-ness” and “free-flow” nurtured and maintained for some time. The risk of wanting to grow too fast, you see? What if robots take over, and all jobs disappear? It seemed to me that the participants in this session were in search for “better”, for “the unnamed quality”, something that resonates with the shift from finite to infinite games, the shift from money to wealth, the shift from having to produce something to the search for deeper relationships. It was as if they all wanted to grow on the Spiral Dynamics tornado of Don Beck. the fear for the loss of the ego. This was an incredible session with +/- 20 participants, lead by @marcpbernegger. to care where your money is invested? to open a shared account? This group was so powerful that I invited the session owner to open their closed Facebook group to the Innotribe Community. As mentioned before, Laura, Mike Maney, myself and several Innotribe team members have been playing with the idea of “Rebels United”. During Sandbox, Laura and myself animated a session on this that was well attended by about 15 young people, 3 of them from a large corporation. Any movement of this kind will need executive sponsorship, but there is a reciprocal value of offering reverse mentorship: how can rebels inspire the current executive leaders? We also introduced the concept of “The Castle and the Sandbox (or the Garage)”. There was a lively discussion that still resonates with me. Is it really such a good idea to isolate innovation projects in a separate “garage” location? 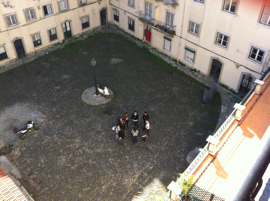 I got even more inspired by the Lisbon City tour that brought us to the “Villas”. The “villas” were actually houses for the poor that were build INSIDE the patio of houses of very rich people. Below picture of the inside of Villa Sousa that was part of our tour. It got me thinking and I was getting more and more confuzed by the polarization effect of the castle/sandbox pitch we like to use so much in Innotribe. Instead of separate innovation ghettos, we might be better off thinking about incubation “floors”, zones, islands, meeting points, plazas, patios, “Villas”, planets, etc, where anybody of the company can look over the shoulder, get interested, and get infected by the innovation virus.